A Tiffany lamp is a type of lamp with different types of glass shades. The most famous was the stained leaded glass lamp. Tiffany lamps are considered part of the Art Nouveau movement. The first Tiffany lamp was created in 1895. Beautiful in design and intricacy, each lamp was handmade by skilled craftsman, not mass or machine produced. Its primary designer was Louis Comfort Tiffany, but a lot of credit should also go to a woman named Clara Driscoll who was the master designer behind the most creative and valuable leaded glass lamps produced by Tiffany Studios. Tiffany's first business venture was an interior design firm in New York, for which he designed stained glass windows. The Irregular Upper and Lower Border lamps carry an openwork crown edge that helps to stimulate a branch, tree, or shrubbery. The Favrile category, which means handcrafted, identifies the first lamps Tiffany made with this label. His initials LCT, later replaced the Favrile stamp. The Geometric category, done primarily by the male craftsman, speaks for itself. The Tiffany craftsman used geometric shapes such as triangles, squares, rectangles, and ovals to form these patterns for these lamps. Next is the Transition to Flowers group, which is subdivided into the Flowered Cone and Globe lamps. All of these lamps follow a nature, or botanical, design using flowers, dragonflies, spiders with webs, butterflies, and peacock feathers. The difference within these two smaller categories is the difference in the lamp shapes, basically a cone and a globe. Tiffany lamps have come to symbolize one of the most enduring symbols of beauty and timeless design in the world of interior design. Although Louis Comfort Tiffany was extremely talented and had several successful careers, his eclectic glass art lamps and other lighting fixtures remain his most memorable creations. Today, you can find genuine Louis Tiffany table lamps, hanging lamps and other fixtures in some of the finest museums and private collections with some fixtures commanding six figures and beyond. The most compelling feature of Tiffany-style lamps is their stunning use and display of high quality art glass. Classic designs by Louis Tiffany include the Hanginghead Dragonfly, Wisteria, and Koi and they were inspired by his love of Nature and the desire to beautify the home with color and vitality. The art glass was hand cut on the original Tiffany lamps and assembled into their designs using the Copper Foil Method first perfected by Louis in the late 19th century. Because of the unique nature of the manufacturing process and the use of hand cut art glass, each and every Tiffany lamp and fixture was a one-of-a-kind original despite the fact that they were still manufactured in factory settings. Tiffany style lamps will gently diffuse the illumination as it passes through the colored shade so that the surrounding decor is imbued with a soothing ambiance and beautiful color. If spending six figures for an original Tiffany lamp is out of the question, the next best thing is to get an excellent replica at affordable prices from companies like Meyda Tiffany. Meyda Tiffany was founded thirty years ago from what began as a hobby. Meyda Tiffany has since evolved into America's leading and oldest manufacturer of Meyda Tiffany lamps. Every Meyda Tiffany lamp is still prepared using the original Copper Foil method. First a pattern for the Meyda Tiffany lamp is drawn out on a heavy piece of cardboard. Next a number and glass color is written on the pattern piece. After the pattern is drawn and labeled, the glass is laid over it and traced. Once the pattern is traced onto the glass, the pieces can be cut and ground to their correct shape. Next the pieces need to be cleaned so the copper foil can be applied to the edges. The copper foil solution allows the pieces to adhere together. After the Meyda Tiffany lamp has been placed accordingly and it is fully bonded, the edges need to be soldered together for a firm hold. Finally after the Meyda Tiffany lamp has been soldered, it is cleaned to bring out its beauty. For decades after the original Tiffany company went into bankruptcy, no new stained glass lamps were made and those remaining began to dwindle to the point that only rich collectors could afford Tiffany lamps. Fortunately for the rest of us, you still have companies like Meyda Tiffany that still make high quality Meyda Tiffany lamp reproductions, using the same materials and Copper Foil method used by Louis Tiffany to make his original masterpieces. 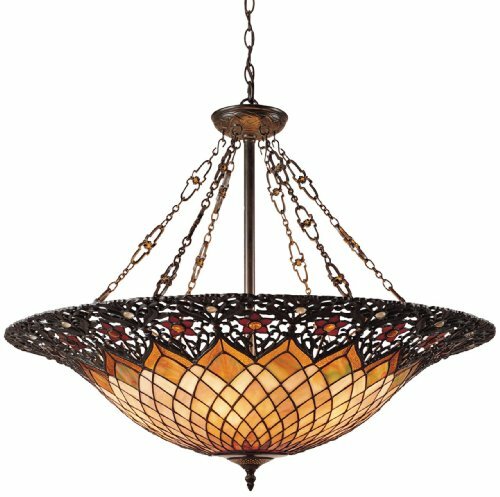 To browse through 24,000+ more tiffany lamp choices, please visit the Tiffany Lamps Superstore. Beautify almost any corner of your home with this eye-catching accent lamp. 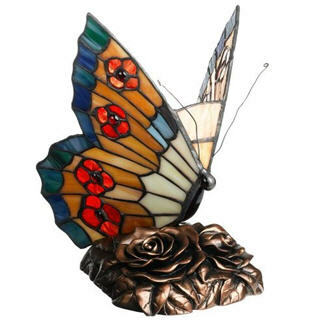 Brighten an entryway, make the dining room more dramatic or bring romance into your bedroom with this charming, handcrafted butterfly, which also makes a great conversation piece. Features bright orange and yellow swirled glass with deep blue and red accents. Sits on a decorative bronze flower base. This gorgeous piece features warm peach shades of opalescent art glass edged with intricate filigree, which is accented with delicate flower designs repeated around the shade. The decorative chain mimics the flower detail in the shade. The metal is finished in an authentic bronze patina. 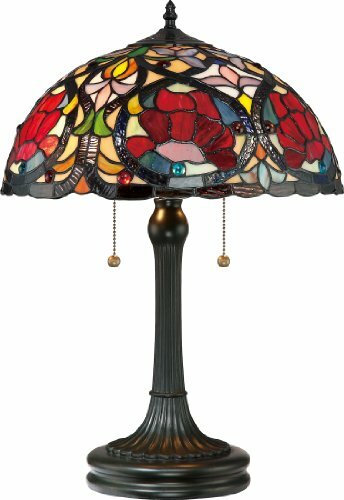 For 24,000+ more tiffany lamp choices, visit the Tiffany Lamps Superstore.